A spacecraft tandem that will deduce the Moon's interior from crust to core is lined up to enter lunar orbit this weekend after a 2.6-million-mile, 3.5-month trek from Earth. Flying independently since their joint launch atop a Delta 2 rocket from Cape Canaveral on Sept. 10, the GRAIL-A and GRAIL-B spacecraft will brake into orbits about the Moon in critical maneuvers Saturday and Sunday, respectively. The $496 million Gravity Recovery and Interior Laboratory project will eventually settle into 34-mile-high orbits by early March and begin creating an unprecedented lunar gravity map that scientists can follow in their quest to determine the Moon's interior structure. "This mission will rewrite the textbooks on the evolution of the Moon," said Maria Zuber, GRAIL principal investigator from the Massachusetts Institute of Technology. "Our two spacecraft are operating so well during their journey that we have performed a full test of our science instrument and confirmed the performance required to meet our science objectives." Instead of barreling straight towards the Moon after launch like the Apollo astronauts, the GRAIL probes took a low-energy trajectory out near the Earth-Sun Lagrange Point before coasting back to their destination. The lengthy path allowed the satellites to "out-gas" on the way, ensuring this phenomena isn't mistaken for gravity measurements during the science-gathering portion of the mission later. 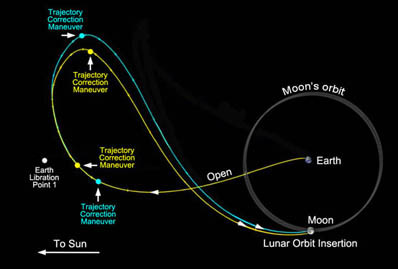 What's more, the lunar orbit insertion burns from the low-energy trajectory will require far less fuel to slow down, enabling designers to build smaller spacecraft and launch the mission aboard a single medium-sized rocket. Flight controllers at satellite-builder Lockheed Martin in Denver and the Jet Propulsion Laboratory in Pasadena will spend New Year's Eve and New Year's Day monitoring telemetry as the spacecraft execute pre-loaded commands to fire the main engines and swoop into lunar orbits 25 hours apart. Approaching from below the lunar south pole at 4,400 mph, the GRAIL-A spacecraft will ignite the main thruster Saturday at 4:21 p.m. EST (2121 GMT) for 40 minutes, slowing the craft by about 427 mph to slip into a preliminary elliptical orbit stretching 11.5 hours. GRAIL-B will follow suit on Sunday, starting its 39-minute burn at 5:05 p.m. EST (2205 GMT) to slow by 430 mph. Confirmation of successful lunar orbit insertions is expected approximately an hour after the burns are finished, NASA officials advise. No live NASA Television coverage of the burns will air and no post-insertion press conferences are planned. Spokespeople will tweet and post Web updates to relay the news. The final set of commands were programmed into the spacecraft earlier this week, and no further tweaks to the flight paths were scheduled ahead of the burns. As of Wednesday, GRAIL-A was 65,860 miles from the Moon and GRAIL-B was 79,540 miles. After the weekend burns, a subsequent month of maneuvers will circularize GRAIL's lunar orbit, followed by another month's worth of work to get the two birds synchronized in precise polar orbits chasing each other around the Moon. "The big challenge of GRAIL is actually getting into the science orbit. We call that the transfer to science formation phase. We have to get the spacecraft very tightly coordinated one around the other. Our navigators are a quarter-million miles away from the Moon trying to orchestrate these two spacecraft into very, very precise orbits. I'm a retired Navy Reserve officer and to me it's like the Blue Angels at the Moon," said David Lehman, GRAIL project manager. The 82-day science phase begins on March 8 with GRAIL-B leading the GRAIL-A spacecraft while flying at an altitude of 34 miles above the Moon. The separation distance between the two will change from 62 to 140 miles over the course of the mapping to dig deeper into the Moon. 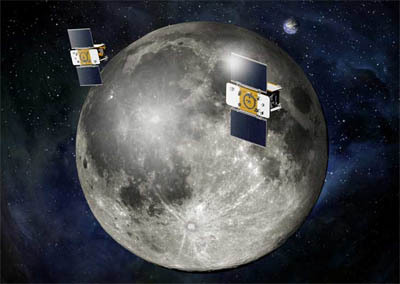 The mirror-image craft will bounce radio signals off each other to measure subtle changes in the distance between the two formation-flying satellites caused by the lunar gravity field, enabling scientists to infer the Moon's origins and the composition of its interior structure. "It's a little bit like doing a CAT scan of the Moon, but we use gravity instead of acoustic waves. It provides us essentially with a picture of the lunar interior just like you'd make a picture of the inside of your body if you were trying to understand what your state of health is," said Zuber. Both craft also carry cameras for the educational MoonKAM program led by Sally Ride, the first American woman in space. Students will select areas of the Moon they want the cameras to capture, with the first pictures expected about a week after the science mapping starts in March. The primary mission will conclude in June. Although officials originally believed the craft would not survive the solar power-starving June 4 lunar eclipse and crash into the Moon soon thereafter, better-than-expected performance from the solar arrays and batteries have the GRAIL team proposing an extended mission to NASA leadership that will map the Moon a second time, albeit from a remarkably close altitude of just 15.5 miles. "Trying to understand how the Moon formed and how it evolved over its history is one of the things we're trying to address with the GRAIL mission, but also how the Moon is an example of how terrestrial planets in general have formed," said Zuber. "The Moon has played a central role in the human imagination and psyche, so much so that when humans reached out and landed on the Moon it really became a defining event for civilization. "Since the dawn of the space age in 1959, there have been 109 missions that have targeted the Moon, 12 humans have walked on the surface of the Moon, we've brought back 842 pounds of rocks and soil that are still being analyzed today. As we speak, there are three spacecraft that are orbiting the Moon and collecting science observations," she continued. "Given all of this activity, do we know everything that we'd like to know about Moon? In short, the answer is no."